I have a two meter high wall that I Would like to plan some wall climbing vines that flower. I remember sitting at a restaurant in Khon Kaen that had some vines climbing the wall and growing overhead on a roof trellis that had some bell like flowers hanging down, but unfortunately I don't know what they are called and I am not in Thailand right now to ask. 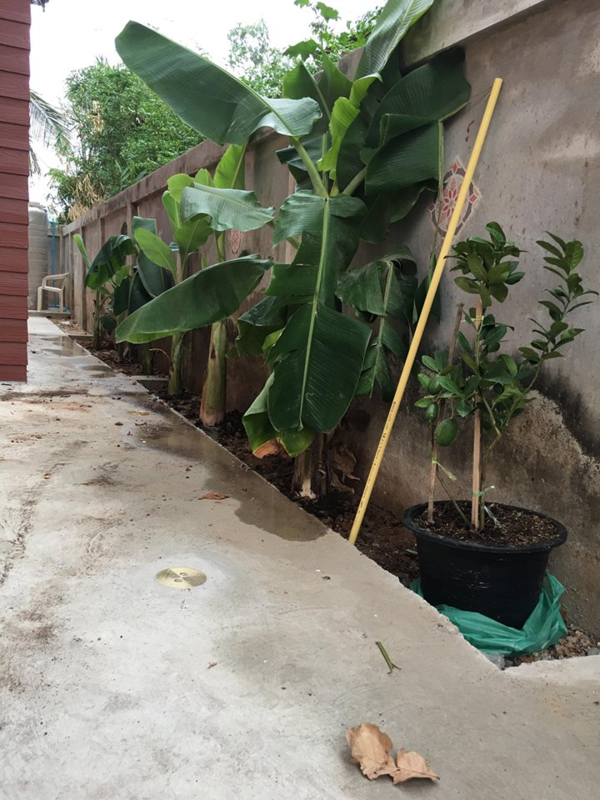 The banana trees have being removed,and planted on the other side of the house where I have plenty of space. (i was told too close to the wall and the roots might damage it) and would like to plant those vine plants that would grow on the wall (i will put trellis on the wall when I come back) and drape over head. The attached presentation is not specific to Thailand, but may help you identify the flowering vines that you saw and liked. Fig vine (Ficus pumila) called 'tokay', like the gekko that clings to the wall, is not flowering, but is self supporting, doesn't need a trellis, and grows fast. Mine had sent up runners to the top of a 2m wall in a year, and I expect it will cover the wall this second year. Does best some shade, especially from afternoon sun. My wife planted this vine and has been training/tying it up along a fence and wall. It just started to bloom and it's incredibly beautiful. I haven't grown it before and with the growth rate I'm seeing, I'm getting a little scared about how it might dominate the limited space we have for it along with other plants. But your wall may be the perfect site if you have time to work with it. It doesn't have self supporting tendrils, so you have to tie it up to direct it, and prune to limit the sprawl. I don't know much about maintenance requirements yet, but it did have a large grasshopper munching on leaves pretty severely. One of our 2 six month old kittens who is always on the hunt took care of that pest problem.